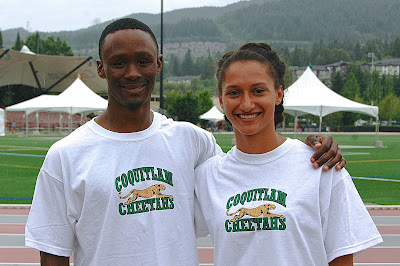 Raquel Tjernagel and Nathan George have been named to Canada's National Team which will be competing at the PanAm Games in Toronto in July. Tjernagel will run both the 200m and the 4x400m relay in Toronto. The grade 12 student will be heading to the University of Texas Longhorns in the fall to begin her University career. This is Tjernagel's third national team and first senior national team. George will be competing in the 4x400m at the PanAm Games and is competing on his fourth Canadian team. Tjernagel and George are our first PanAm Team Members since 1999, when in Winnipeg our Head Coach also ran the 200m.